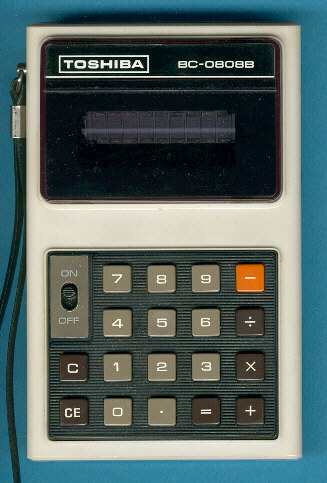 Size: 5.9" x 3.9" x 1.3"
This Toshiba BC-0808B demonstrates the huge steps from the first Toshiba calculators BC-0801B and BC-0802 to the handy pocket calculator. All dimensions and the weigh were reduced but the functionality kept. Don't miss the BC-602L with a narrow 6 digit display and the BC-0811B combining the "old style" housing with the "modern" keys.